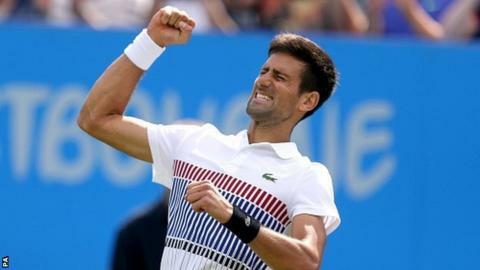 Novak Djokovic proved his form for Wimbledon by beating Gael Monfils 6-3 6-4 to win the Aegon International. The three-time Wimbledon winner has had a below-par season but did not drop a set in his first Eastbourne appearance. It was the 12-time Grand Slam champion's first title since January and the 68th of his career. Djokovic, who was playing the week before Wimbledon for the first time since 2010, faces Slovakia's Martin Klizan in the first round at SW19. The Serb also confirmed his friend and former player Mario Ancic would join his coaching team, along with Andre Agassi, on a temporary basis at Wimbledon. Djokovic controlled Saturday's final from the start, breaking Monfils' serve in the opening game and again in the first set's final game. The second set was closely contested but the former world number one broke the Frenchman in what turned out to be the final game to seal victory in 76 minutes. Victory maintained Djokovic's 100% record against Monfils, who took the result in good humour and said: "We played 14 times and it's 14-0, so well done again."